Coming home from an errand as I approached the front door, I caught a glimpse of a bit of movement on the ground from a slight breeze that had blown across the front of the house. As I approached and bent over in investigation I found a solitary monarch butterfly wing shifting with every little breathe of air that moved across it's delicate silken surface. I picked up the delicate and frail fragment of what had once been a thriving creature. The orange seemed dull from the lack of life as if without the flutter of the spirit the wing could not retain its vibrance. 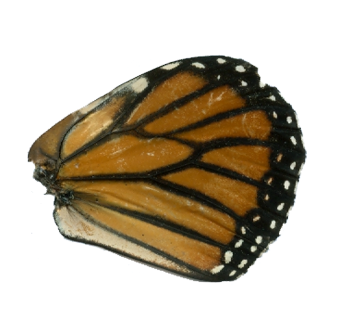 The monarch had fulfilled the measure of its creation. This was what remained. September has come and soon much of the garden will shed its wings as well. What a lovely post to commend the end of one season & the beginning of another. Beautifully put Cindy. Although I am not ready for the season to end. It seemed all too short to me this year. I often think these little finds are reminders from nature that event the tiniest changes herald new seasons. What a lovely blog you have; I'm enjoying it. Oh, so sad.... Sept always brings some nostalgic feelings to my heart... indeed, Fall is upon us! Ps: the House in the Roses is having a Window Party this Friday, and wish you could participate.... only thing you need to do is show us your favorite window of your home.... it promises to be fun! come see! Having not had much of a Summer here in the UK I started early on Autumn decorating. I was rewarded by a beautiful sunny morning today. The change is in the air and plants have set seed, but the leaves haven't turned yet. I'm not ready for it to end! All of the wonderful plants, flowers, vegetables...sigh. Beautifully felt and written, Cindy! As always there seems to be poetry to your writings. The monarchs are so graceful and one of the many beauties of summer, the changing of seasons always seems to make me want to hold on a little longer to the one we are in. I really am not ready for fall to come, so many dear friends leave... soon it will be our fun humming birds.